Susan has been talking about different sources of inspiration on her Simplicity blog this past week. Her OLW challenge this week was to be inspired by nature. I love the outdoors, and I am most inspired by colors. I especially like the colors of sunsets. Living in Colorado, we have spectacular sunsets over the mountains. 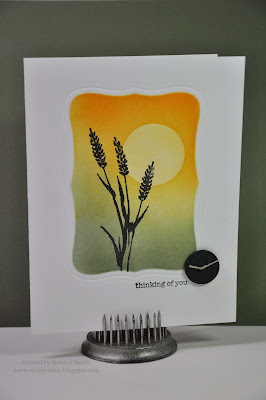 I would never be able to recreate the beauty of our sunsets on a card, but at least you can tell that is what it is. The button was not planned, but I needed something to cover up a smudge from not masking adequately when I sponged the background. That also changed my placement of the sentiment. It still turned out ok, though, the image is just how I visualized it. By the way, my mom and I got beat 2 games to 0 in euchre tonight. Just wait 'til tomorrow (tonight, since it is 2 AM now). We're gonna take them down! I love how you've done the impression with the spellbinder die. Your sponging looks flawless...and kudos to you for saving the card by addding the button!! 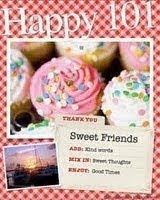 Beautiful card - and I'm glad you had that smudge because I really the looks of the button! Love the color wash,,,so clean and simply beautiful. Oh! This is definitely the best of the bunch so far this week! Stunning! And, I know what you mean about those Colorado sunsets...I miss them soooo much! Your sponging of color, the embossed shape, the image placement, everything is perfect about this card! I have left you alittle something over on my blog. I really like your style and look forward to seeing alot more of it. I am a new face to your Blog and I am very impressed. You have given me so much inspiration, I don't know where to begin, but I will have fun trying. Thanks so much.